Giardia is a single celled organism than can be found in the intestine of mammals and birds. Many animals that have Giardia in their bodies do not experience problems, but even after a long problem-free period symptoms can occur. Symptoms are diarrhea, malnutrition symptoms, itching, feather plucking and weight loss. A cockatoo can get infected with Giardia by being exposed to an infected bird. This can be any bird species or its droppings. 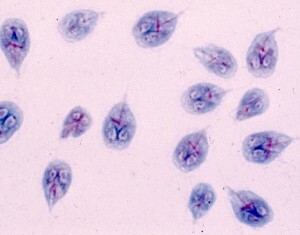 Giardia in cockatoos is not contagious to humans or other mammals, but it is contagious to all other birds. Giardia will periodically be present in the droppings of infected birds. At other times, birds that are infected will not excrete any Giardia cells in their droppings. A vet can diagnose Giardia by taking a sample of fresh cockatoo faeces. Because the Giardia cells are not always present, diagnosis is not 100% accurate. Another checkup a few days or weeks later will improve accuracy. There are different kinds of medicine available to treat Giardia. Your vet can advise you on the correct medicine. Products that have proven to work in some cases, are: dimetridazole, paromomycin, fenbendazole and metronidazole (Flagyl). These drugs do have side effects. Some cockatoos will never become clear of Giardia infection. When the immune system of the cockatoo is less strong, problems can arise again. To keep immune function high and infection risk low, you should feed a balanced diet, keep the cage very clean and clean the water bowl especially well. Using a water bottle instead of a water bowl will greatly reduce the risk of reinfection after treatment and will generally lower the amount of Giardia cells around your cockatoo.